It's time for the kiddos to go back to school once again. 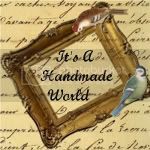 Find trendy gifts and supplies made by handmade artists. If you are a handmade artist, feel free to add some of your back to school items. Have a great year everyone. Hello everyone. It's finally starting to warm up some and the trees are blooming. Let's have some fun. List your handmade items and share this post on all of your social media venues. Let's get some exposure for our awesome handmade gifts and goods. Post your handmade goods on this blog site. Let's get the word out there to BUY HANDMADE. You all know how I love all things green. Well Listia is a site where you can get rid of some of your things you don't need anymore for points and then go shopping with the points you earned. They have a rewards store with amazing items for you to buy with your points. It is completely free. Check it out and sign up today! Check out my studio at HopesAndDreamsStudio.artfire.com. I love to create and make things with my hands. I have TONS of hobbies. They vary greatly from jewelry making to candle making, from gardening to crocheting, from painting to composting. I take enjoyment in most things. I LOVE all things GREEN.